The Sorghum-Sudan grass that I planted is a real grower. Warm temperatures have helped push it along. I decided to go with it this year rather than annual rye grass or some of the other commonly used cover crops because I had a little more time to let it grow since my patch prep was started early and I had read some great things about it. Sudan grass is a warm-season annual grass that is an excellent green manure. It has a high biomass, grows fast (up to 6 feet in Colorado), adds a little nitrogen, blocks out weeds, helps build mycorrhizal fungi in the soil, loosens subbsoil with deep roots and has nematode and disease suppression qualities. I planted it about two weeks ago and it is already about 3 inches tall. That looks great Jamie. I'm in the beginning stages of patch prep and hope to get winter rye and hairy vetch in the ground by next week. weather might have something to say about thta though. Your patch will be one to watch next year for sure. I don't know if it will be one to watch. 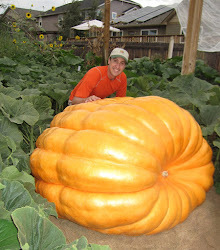 All I know is if I can get a pumpkin to scale next year it will be a success. i try to direct all hailstorms away from colorado next year. I'll Use a real big fan.